T he lives of students at Osgoode Hall Law School in the 1890s involved more than the serious scholarly pursuits of attending classes, articling, and writing examinations. Debates, dinners and dances, held under the auspices of the Osgoode Hall Legal and Literary Society, provided respite from the hard work of the school year. 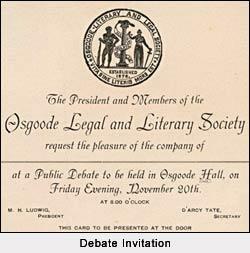 Debating was considered excellent training for future lawyers, and the Osgoode Legal and Literary Society sponsored several public debates in the 1890s. 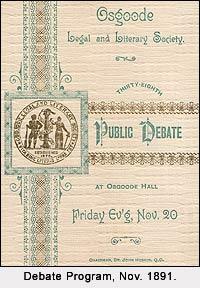 On the evening of Friday, Nov. 20th, 1891, the subject for the debate was: "Resolved, That the system of professional close corporations created and protected by special legislation should be discouraged." Among the debaters was future Ontario Premier G. Howard Ferguson. Public debates were not all serious business, though. On that occasion the actual debate was preceded by an overture from the Harmony Orchestra, a chorus from the Osgoode Glee Club, and a song by Mrs. Caldwell. Following the debate, the Harmony Orchestra played selections from Flotow's opera Martha , the Misses Gordon performed a piano duet, Mrs. Caldwell sang another song, W.E. Lincoln Hunter (called to the Bar in 1891) read from Poe's The Murderer , and the Glee Club and the Orchestra wrapped up the evening. 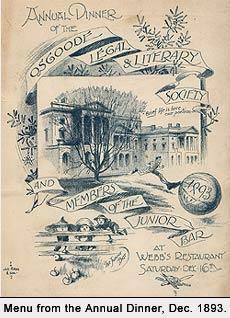 The Osgoode Legal and Literary Society held an annual dinner, usually at Webb's Restaurant at 66-68 Yonge Street, on the site of what is now One King West. Webb's extensive catering establishment included a dining room with facilities to serve 300 guests and was the "in" place to hold large dinners at the time. The sumptuous multi-course meals were accompanied by several toasts: to the Queen, the Senior Bar, the Junior Bar, the Legal and Literary Society, the Student at Law, and lastly, to the Ladies. The 1891 dinner, held Dec. 17th at Webb's, began with oysters on the shell, hors d'oeuvres and soup, and then proceeded through a fish course, entrees, a meat course, a game course, a dessert course, ices and cookies, fruits, and coffee. Speeches accompanied the meal; newspaper coverage of the 1891 dinner noted that their character was "wit rather than wisdom. All the speakers appreciated the fact that the young lawyers and the young men who are not yet lawyers left their law books behind and met together for jollity." Another highlight of the law school year was the Osgoode Legal and Literary Society annual dance, the "At Home". 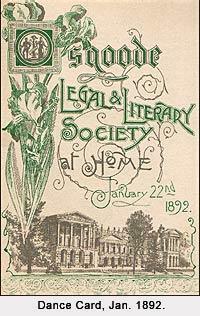 More than 1000 law students, judges and lawyers, and their wives and daughters attended the "annual gaieties of the law students," the January 1892 "At Home", which the Globe described as the "social event of the year." The dance featured three orchestras that played simultaneously in Convocation Hall, the Great Library, and the law school. Webb's catered an enormous buffet. Security was tight, and twelve firemen were on hand in case of accident. The Globe printed almost two full columns listing the names of those who attended the dance. The Law Society Archives has in its collection a dance card from each of the 1892 and 1893 At Homes, one with a tiny pencil still attached. Thanks to these two young lawyers, we can enjoy a glimpse of the past. Mallon and Ford went on to distinguished legal careers. Mallon, called to the Bar in 1893, was for ten years a law partner of Francis Anglin, who went on to become Chief Justice of Canada. Mallon himself became Inspector of Legal and Registry Offices and Registrar of Deeds for the County of York. Ford, called to the Bar in 1895, continued his career in Western Canada, culminating in appointments to the Alberta Supreme Court and the Alberta Court of Appeal. Both Mallon and Ford must have continued to feel keen nostalgia for their law school days for them to have kept these mementoes throughout their lives.